Subtitles stem from a transcript or screenplay of the dialog or commentary in movies, TV shows, video games, etc, with file extensions in .srt, .sub, and .sbv. Usually displayed at the bottom of the screen, subtitles help viewers, who have hearing problems or cannot understand the language, to follow the dialog. As a result, you'll need to add subtitles of your preference while appreciating a foreign movie, unless you know the language. If you are having the issue and want to add subtitles to AVI movies or videos as aforesaid, find your answer here. This guide will focus on how to embed SRT subtitles to AVI file using MacX Video Converter Pro, which helps you not only merge SRT with AVI file but also add subtitles to MP4, MKV, WMV, MOV, FLV, etc, so that you can enjoy your AVI videos with subtitles. Free download AVI subtitles merge software to add hardcode subtitles to AVI, MKV, MP4, WMV, etc and easily convert any video with internal/forced/external srt movie subtitles. So you've saved a heap of downloaded AVI movies, TV shows, etc in foreign language and feel like to put subtitles into AVI for better understanding? Before the process, you'll need to prepare the subtitle files for your AVI movie. But if you've got the subtitles beforehand, please directly move the part 2 to add subtitles to AVI file. Step 2: Create a new folder and place the subtitles file into it. Step 3: Take your AVI video file into the folder. Step 4: Rename the SRT file to make it the same as your AVI file. For instance, if your video is Frozen.avi, change your SRT subtitle file into Frozen.srt. In case you prepared the SRT subtitles, you can start to combine SRT subtitles with AVI file using MacX Video Converter Pro. Tips: MacXDVD provides two versions of SRT to AVI merger. 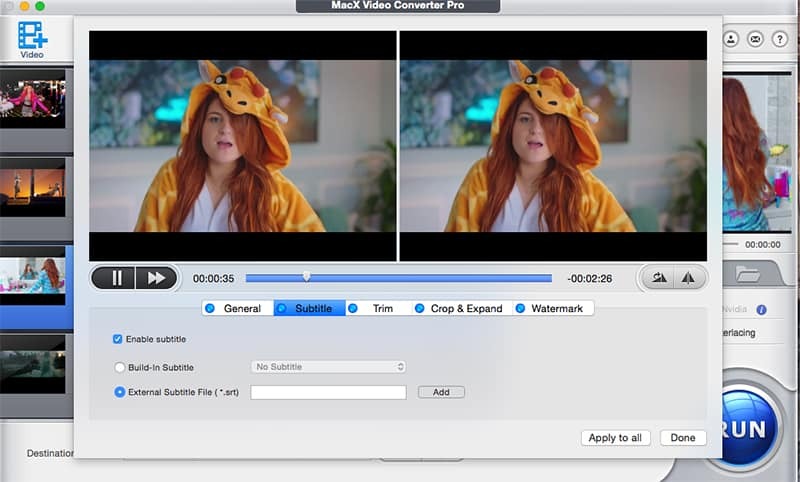 For Mac users, please download MacX Video Converter Pro for the SRT to AVI merging task. For Windows users, you can head over to the MacX HD Video Converter Pro for Windows to finish the task. Here we take the Mac edition for example. Step 1: Free download and fire up this subtitles to AVI merging software on your Mac, import the source video by clicking "Add File" button. You can also add more than one AVI video files at a time. Step 2: Choose AVI Video (MPEG 4 or H264) as the output format from the pop-up window. Tips: This video converter for Mac also works as a monster to add SRT subtitles to MKV, MOV, FLV, WMV, etc. video files and is able to convert video to AVI, MKV, MP4, WMV, MOV, etc and add srt subtitles with movie files as you like. Step 3: Click "Edit" button on the main interface of this tool. Go and hit "Enable subtitle" -> "External Subtitle File" and press "Add" button to choose your saved .srt file. Move the mouse to "Done" button and click it to finish adding .srt file to AVI video. To edit AVI files with SRT subtitles, you have another choice-add subtitles to iMovie for AVI video editing after AVI to MP4/MOV conversion. Step 4: Hit the "RUN" button to start to put subtitles on AVI video on your Mac OS X. After a few seconds, you can watch your AVI movies with your preferred language track. Subtitle files can be a challenge in case the text doesn't synchronize with your AVI video, this especially happening in VLC subtitles video out of sync problem. This also holds true if you want to add personalized subtitles to your videos or recordings. To easily make your own .srt file before you add subtitles to AVI recordings, you can count on Notepad, WordPad or other text editor. Make sure SRT comprises four parts including a number signifying the subtitle sequence, the time indicating the appearance and disappearance of the subtitles on the screen, the subtitles themselves, and a blank line for starting a new subtitle. Ever wondered how to add .srt subtitles to a movie file with Handbrake? This article shares a Handbrake subtitle tutorial for you to add and attach soft or hard subtitle using Handbrake, so that you can watch movies with your preferred language.